On your marks. Get set. Go! Your flight’s boarding and the race to make it to your cramped seat on time is on. If you’ve ever almost missed your plane, you know the feeling. 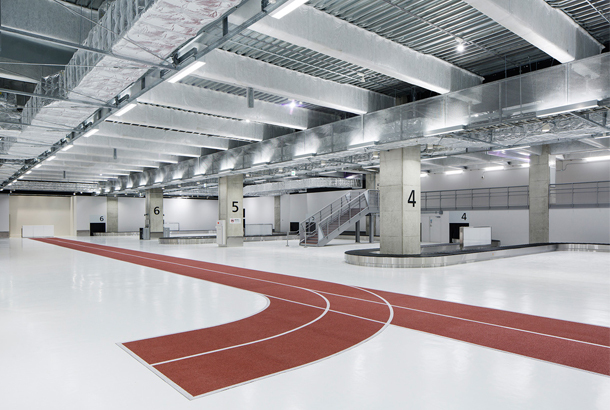 Sprinting through the airport in a panic has never felt or looked cool, except for maybe at Tokyo’s Narita International Airport (NRT), where the Terminal 3 walkways were just transformed into running racetrack lanes. Yes, those. 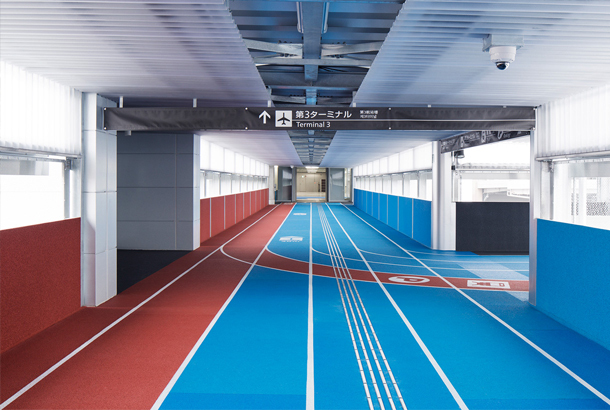 Japan’s largest airport rolled out the sporty upgrade last week as part of the promotional and logistical runup to the 2020 Summer Olympic Games in Tokyo. The clever floor designs, which look and feel pretty much exactly like the typical shock-absorbing rubberized tracks used in track and field, come in brick red and sky blue. The winding, white-lined pathways don’t just look pretty; they’re useful, too, intended to guide harried hordes of travelers in the directions they need to go. Red lanes lead to airport arrivals areas, blue to departures. Convenient, cushioned and and campy. We like it. Conceptualized in part by Japanese advertising and design house PARTY and primarily constructed by Nikkei Sekkei,the overhauled terminal bearing the fresh racetrack lanes was unveiled on April 8 as an area dedicated to low-cost commercial airlines alone. Flying with the theme of budget airlines and “economic reasonability,” the project’s architects chose not to install the usual unimaginative airport illuminated signs and moving walkways. 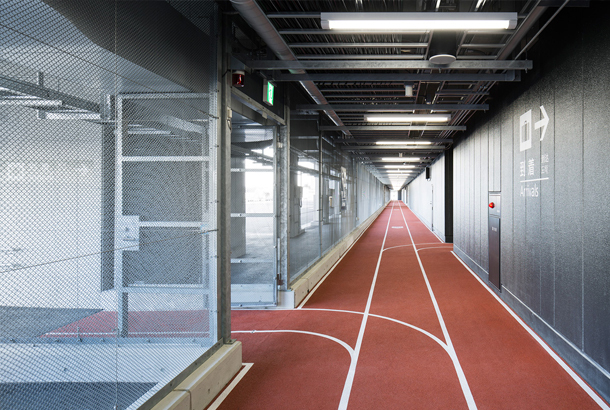 “Instead, to offer an exciting walking experience that is easy on the feet, we implemented running tracks used for track and field, and added signage for user friendly guidance,” PARTY noted on an official website about NRT’s unique Terminal 3 visual aesthetic. Notice the operative word there? Walking. Not running, though we imagine more than a few cheeky travelers won’t be able to resist the urge to Usain Bolt. Just think of all the starting line selfies and silly photo finishes (and selfie-stick injuries) to come.